Samir Selmanovic is an author, speaker, and community organizer known particularly for his work in interfaith dialogue. Born and raised in a culturally Muslim but atheistic family in Croatia, as a teenager he joined an underground group of believers and became a Christian. His religious studies took him to the US, and he eventually came to work as a pastor in New York City, where he dealt with the aftermath of the terrorist attacks of 2001 and founded a multi-faith community called Faith House Manhattan. He is the director of Citylights, a Christian community that seeks to “learn to love well.” We asked him about his deep passion for connecting with those outside the Christian faith. You say that an evangelistic encounter with “the other” is a two-way street. Can you give an example of this? A few folks looked back at me quietly, then glanced at the church, noticing it perhaps for the very first time. I thought that was funny. Nobody else laughed. One person said I was making a circus out of the meeting. I said our meetings had been a circus—until now. It was a difficult start to the evening for everyone. Why? Because, in the presence of “the other,” everything had to change. Our tone, our language, our goals, our methods. Our guests asked us questions, curiously, patiently. And we had to speak in plain English instead of “Christianese.” They asked us about what we carry inside and why we want to tell others about it. By the end of the evening, our gracious guests actually helped us name the pearl that our Christian community had been holding—Jesus’ teaching about the kingdom of God. We abandoned our plans to put on a show about fulfilled prophecies of the Bible and instead—as simply as we can—explain some of the teachings of Jesus. That’s what they wanted to know about. They evangelized us! God “trespassed” outside the boundaries of our religion and then visited us in the stranger, as God did so often in the Bible. What are some of the common pitfalls in terms of evangelistic efforts of Christians today? The main one I think is to tend to distrust the gospel while sharing it. God does not need to be defended, and people do not have to be manipulated. The kingdom of God is above that. When Christ tells me to go out to the world and share his teachings, he asks me to embody that teaching, namely to treat others the way I want to be treated (Matthew 7:12). This command, which has come to be known as the Golden Rule, excludes turning other people from subjects to objects, even the objects of my best intentions. I would not want to be objectified by their efforts to reach me, so neither should I objectify them. If I am to reach them, I should also be reached by them. The Golden Rule turns the tables on our religious impulses. If we want outsiders to attend our events, we must attend their events. If we want them to be spiritually open to us, we must be spiritually open to them. If we want them to change, we must be ready to change. If we want them to read our Scriptures with trust and respect, we likewise must read their holy texts. We must not be afraid to be changed by them. In the kingdom of God, there is no room for fear. Without modeling learning and receiving, we cannot expect others to learn and receive from us. Yet, this goes further. Our openness to “the other” is not just a method of approaching them. We really do need them. They comfort us, bless us, teach us. Some of us have been living under the assumption that while the world needs Christians, Christians don’t need the world. There is no reciprocity or interdependence. When we objectify the world and other religions, they have no significant commission to us. What do you do with the Great Commission? What role does evangelism play? Instead of designating the call of Christ as the Great Commission that establishes Christianity as a God-management system and Christians as brokers of God to the world, perhaps we should embrace the call of Christ as the Great Invitation. Christians are sent out into the world with an extraordinary message: The self-giving God calls humanity to self-giving love! However, instead of having a commission to bring God out to the world, we are in reality invited into the world where God already is, not only to bless the world with Christ’s teaching but also to receive the blessing from God that is already in that same world. We are called not only to go, but also to welcome; not only to teach, but also to learn; not only to give, but also to receive. In a Great Commission, the world needs us and we don’t need the world. In the Great Invitation, we humbly embrace our creaturehood and sit at a large table where not we but God presides. The Great Commission demands conversion from them; the Great Invitation demands transformation from us all. By working with people of other faiths I have discovered that while every religion has its own mystery, our mysteries still need one another. We live on one increasingly small planet, and the challenge for us Christians is to abandon the fantasies about Christian supremacy and get on with learning to be a part of the whole. You did not always take this approach in your ministry to nonbelievers. What kind of experiences caused a shift in your thinking about how to approach sharing the good news? God pulls me out of the hole, usually. And some light comes out of it. A while back, when speaking at a rabbinical college on the topic of pluralism, I began by telling the students and faculty why many of us who are Christians feel an urgency to convert them. I told them about the hopelessness and meaninglessness of life without Jesus and the futility of being one’s own savior. Then I told them about the end times and how eternity without Jesus would look. I did not plan to say any of that. I just said what I know we are saying to people. They looked at me; I looked at them. I stood in my hole before them, silence between us. I waited for the good Lord to fulfill his promise of giving me the right words when I needed them, and suddenly I blurted out, “The good news could be a lot better, huh?” The group broke into laughter, and the pressure was released. But I had not meant this to be funny at all. In fact, I was on the verge of tears. I had given our common good news testimony and realized that what we had to share was neither good nor new. As with the guests who came to my church, who helped us better understand evangelistic outreach, the day at the rabbinical college finished with hugs and delight and mutual blessings. And they insisted that I explain why I really stick with Jesus! How is the good news good? How is the good news new? This requires some serious commitment to honesty, plain language, and recognition of God’s presence in us, among us, and outside of us, the kingdom of God everywhere. I believe there is no Christianity without evangelism. But it also stands that evangelism without Christ is no evangelism at all. 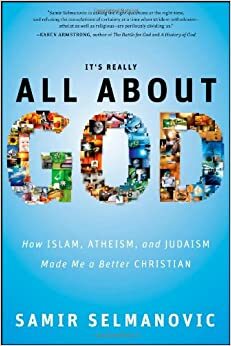 Samir Selmanovic is the author of It’s Really All About God (Jossey-Bass, 2009). Learn more about his work at ItsReallyAllAboutGod.com, FaithHouseManhattan.org, and CityLightsCommunity.org.